While the nation debates the amendment of the Constitution to provide explicitly for expropriation without compensation, the Constitutional Court is preparing to rule on the rights of poor black communities in mineral-rich former homelands who are routinely dispossessed without consultation, compensation or even formal expropriation. Poor communities in mineral-rich former homelands are dispossessed through the Mineral and Petroleum Resources Development Act of 2002 (MPRDA), which has been interpreted to privilege mining over the protection of surface rights guaranteed in the Interim Protection of Informal Land Rights Act of 1996 (IPILRA). The dispossession of black surface rights to land in mining-affected areas was aired in the Constitutional Court on the 24 May in an appeal against an eviction order granted by the North West High Court in respect of members of the Lesetlheng Village Community. Lesetlheng is a village within the Bakgatla-ba-Kgafela traditional community headed by Kgosi Nyalala Pilane, who is also the deputy president of the Congress of Traditional Leaders of South Africa, Contralesa. This is the third appeal that has come before the Constitutional Court in respect of the Bakgatla-ba-Kgafela. Two previous judgments delivered stinging rebukes about lack of accountability and the privileging of the Kgosi’s interests over those of community members. Lesetlheng has a history that is fairly common in North West. Thirteen families came together in 1916 and raised enough money to buy the farm Wilgespruit in 1919 for farming and grazing. They intended to buy this land in their own right, not for, with, or on behalf of the Bakgatla-ba-Kgafela tribe. However, the laws, policies, and practices in operation in the Transvaal, and other parts of South Africa, at the time prevented black people from owning land in their own right. The “six-native rule” required that any group of six or more black people buying land had to affiliate with a recognised tribe. The land would then be registered in the name of the Minister of Native Affairs to be held in trust on behalf of the tribe. The names of the actual purchasers of the land were not recorded on the title. This was part of various efforts by the colonial and later the apartheid regimes to undermine ownership of land by black people. For ease of control, they vested land rights of individuals and smaller sub-groups in tribal units that were inextricably tied to traditional leaders who got their powers from, and were accountable to, the state and not their people. Despite the fact that their land was registered in the name of the Minister of Native Affairs on behalf of the Bakgatla-ba-Kgafela tribe, the 13 families exercised exclusive use and control of the Wilgespruit farm for over a century. Unfortunately for those 13 families, Wilgespruit is now in the middle of the massive expansion of platinum mining in North West. This expansion has occurred on densely populated land falling within the jurisdiction of traditional authorities, including the Bakgatla-ba-Kgafela Traditional Authority. In 2008, after a decision purportedly made by the massive Bakgatla-ba-Kgafela traditional community, rather than the 13 families directly affected, Itereleng Bakgatla Mineral Resources (IBMR) applied for and obtained a mining right over land that included Wilgespruit. This right was obtained without the consent of, or meaningful engagement with, the Lesetlheng Community. This right was eventually ceded to Pilanesberg Platinum Mines (PPM), who immediately began clearing vegetation and excavating soil to exercise their mining right with complete disregard of the surface land rights held by the people of Lesetlheng. After encountering resistance from the Lesetlheng community, PPM applied for, and was granted, an order to evict people from Wilgespruit. This order was the subject of the appeal on which the Constitutional Court is expected soon to rule. The Land Access Movement of South Africa, LAMOSA, and the Xolobeni community intervened in the application as amici curiae or friends of the court with expert knowledge. The Xolobeni community is facing a similar threat of dispossession due to mining operations on the Wild Coast of the Eastern Cape Province. The Lesetlheng community based their appeal on their land ownership status arguing that it was only because of racially discriminatory laws and policies that the land had not been registered in their names, but in that of the Bakgatla-ba-Kgafela traditional community. Expropriation expert Adv Gerrit Grobler SC represented IBMR, one of whose directors is Kgosi Pilane, and PPM in seeking to uphold the eviction order against the Lesetlheng community. He argued that the right to mine trumped all other rights over the land and that on this basis alone they were entitled to evict people who had been farming the land for over 100 years without even expropriating their surface rights. The justices at the hearing greeted some of Grobler’s claims with apparent incredulity. In particular, his statement that the granting of a mining right implicitly expropriates the surface rights of poor black communities without requiring due process or compensation determined in advance. The justices, particularly Deputy Chief Justice Raymond Zondo and judges Chris Jafta, Johan Froneman and Leona Theron, repeatedly questioned his assertion that mining houses may evict black land holders without formally terminating their rights, or triggering the dispute mechanism in section 54 of the MPRDA. In my view, Section 54 is deeply inadequate in that it provides for compensation to be determined only after a mining right has been granted, mining has commenced and a dispute has arisen. This requires the intervention of the Department of Mineral Resources. Tellingly, despite ample disputes arising between communities and their traditional leaders and mining houses, the department has never initiated a Section 54 dispute-resolution process. The outcome of the case depends on how the Constituonal Court interprets the two crucial laws, the MPRDA and IPILRA. The MPRDA makes the state the custodian of all the mineral wealth in South Africa and tasks it with allocating mining rights. It does not require the consent of the owner or occupier of land before a mining right is granted or can be exercised. For mostly white landowners with registered title deeds, the practice is that a mining company negotiates with the owner and agrees, usually through legal representativies, on a surface lease that includes compensated for any loss that results from the exercise of the mining right. This process is clear because the rights, including the nature of the rights held, are registered in the Deeds Office in the name of the holder. It is a very different story for black rural communities and people living on land that falls under the jurisdiction of traditional leaders. In such instances the registered nominal owner of the land is the Minister of Rural Development and Land Reform. The actual holders of rights, and the nature of the rights they hold, are not formally recorded. The practice in such instances has been that the Department of Mineral Resources encourages mining houses to engage with officially recognised traditional leaders rather than with the people who actually hold rights to the land and will directly be affected by mining. In both the Bakgatla and Xolobeni contexts, the officially recognised traditional leader is a shareholder in the mining operations. This practice contradicts IPILRA, which recognises the injustices that arise from colonial and apartheid processes of centralising ownership rights and decision-making powers in traditional leaders. IPILRA, and policies adopted to give effect to it, require that the people directly affected by the deprivation of informal rights must be the ones consulted, and their consent obtained before the Minister of Rural Development and Land Reform, who is the nominal owner of most communal land, can sign off on decisions that would deprive them of their rights. The crux of the submission by the Xolobeni community is that the unquestioned primacy given to mineral rights by the way in which the MPRDA has been interpreted has resulted in the continued dispossession of poor black communities without their consent — and without compensation. These processes, which purport to comply with the Constitution and the MPRDA, default to colonial and apartheid stereotypes. The Xolobeni amicus application argued that the MPRDA and IPILRA must be read together in order to ensure that the land rights of communities are protected and good faith negotiations are completed before mining starts and communities are deprived of their rights. There is hope for a positive judgment setting aside the eviction order and providing clarity on the correct interpretation of the MPRDA and IPILRA in relation to the surface rights of vulnerable black communities. But that would not be the end of the threat to rural people whose land has become more valuable for what is beneth it than for what is on it. 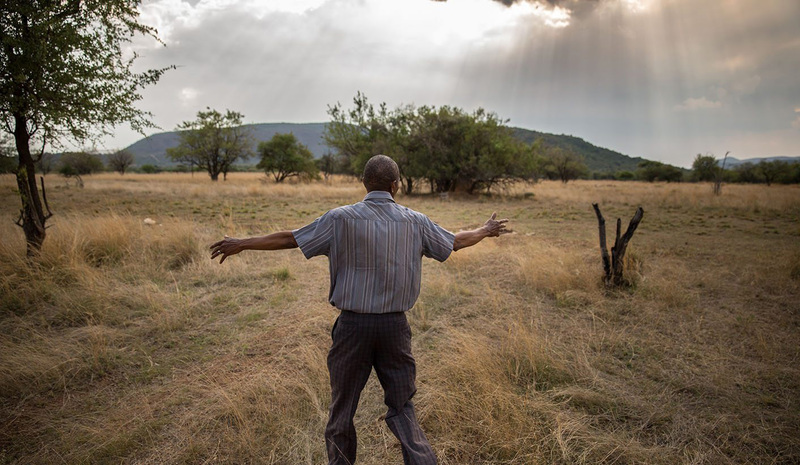 Waiting in the wings is the Traditional and Khoi-San Leadership Bill (TKLB), which would empower traditional councils to conclude agreements with third parties, including mining houses, that bind the land rights of rural citizens without obtaining their consent. The bill has already been adopted by the National Assembly and is currently before the National Council of Provinces.